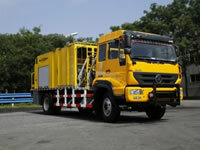 Traffic cone placement and retrieval vehicles are a piece of specialized equipment used to automatically place traffic cones on the pavement. Taking actual client needs into consideration, this vehicle is designed not to cross the edge line, and is also designed to move at slow speeds. The distance between traffic cones is customizable between 2 and 10 meters. 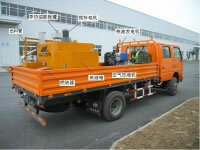 Range of Speed 2～115 km/h Two Speed Transfer Case is Equipped. The storage chamber holds up to 315 traffic cones, and the rear cargo compartment can store about 100 traffic cones. A green laser is installed to guide the driver, so that the driver remains on the desired path for a straight line cone placement. 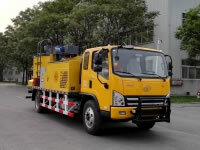 The reverse driving assistant and reversing camera reflect the actual conditions for the traffic cone placement in the operator cab. In doing so, operators can monitor performance in real time. 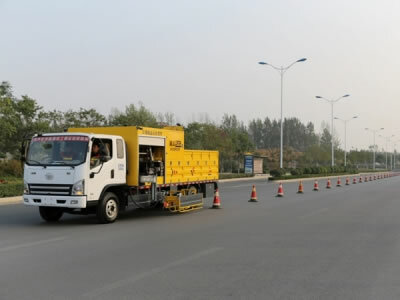 Along with placing traffic cones, this vehicle can also place other safety items, including speed limit signs, other signs, and traffic barriers. 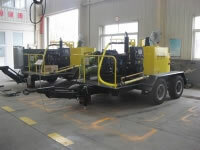 The storage space is located on the top of the cone placement and retrieval vehicle, and can be used to quickly place or remove safety facilities in a work zone before road maintenance. 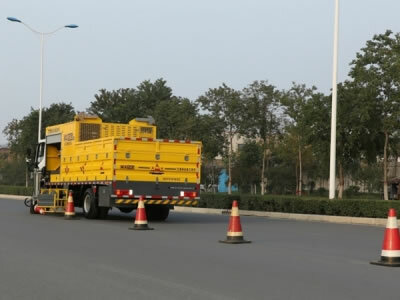 The traffic cones can be placed on both sides of the vehicle.